I’m using a fairly simple mailbox structure in Apple Mail. In each of my IMAP accounts, I’ve created an “Archive” mailbox. Once a day or so, I move all the unflagged, read messages from each inbox to the corresponding Archive mailbox for that account. Here’s an AppleScript that automates this inbox sweeping. 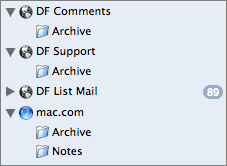 It assumes that every IMAP account (including .Mac accounts) has an Archive mailbox. account. This action is not undoable." set _inbox to _acct's mailbox "INBOX"
set _archive_box to _acct's mailbox "Archive"
The point is to make it as easy as possible to keep my inboxes clear of everything other than unread and flagged messages. This is a nice example of using a whose clause to create a filtered reference to a list of items that meet certain criteria — in this case, the read, unflagged messages of each inbox. Mail’s scripting support also allows us to move the entire list of messages en masse. I.e. we don’t need to loop through each message in the inboxes one at a time to find the read unflagged ones, and we don’t need to move them one at a time to the Archive mailboxes. The script itself seems to run pretty fast in my use (mainly because of the aforementioned point that it doesn’t loop through messages one at a time), but it might take a few seconds for Mail to finish moving the messages out of your inboxes. Use Mail’s Activity Viewer to watch the progress of the messages being moved. move _msg_list to mailbox "Archive Mailbox Name"
move _msg_list to mailbox "Top-Level Mailbox/Archive Mailbox Name"